WATERLOO – Wilfrid Laurier University’s School of Business and Economics welcomes Laurier alumnus and president of Fidelity Investments Canada, Rob Strickland, as this year’s CEO-in-Residence address. The event takes place Nov. 26 at 11:30 a.m. in the Paul Martin Centre on Laurier’s Waterloo campus. Strickland’s talk will be a fireside chat with Micheál Kelly, dean of Laurier’s School of Business and Economics, where Kelly will ask Strickland questions about his career path and lessons learned. Strickland graduated from Laurier with an honours degree in business in 1983. 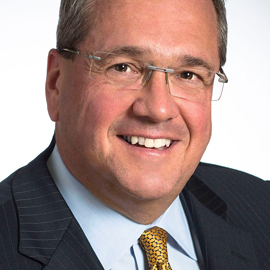 He became president of Fidelity Investments Canada Limited in 2005 after joining the firm in 2003 as executive vice president and head advisor of sales. His career in the financial services industry spans 20 years, including senior roles at TD Bank Financial Group and Nesbitt Burns Securities Limited. He also holds an MBA from McMaster University. The Laurier CEO-In-Residence is an appointed honour by the dean of the School of Business and Economics, and has been developed to deliver a perspective to students beyond their studies and research in the classroom. Stacey Mowbray (BBA ’84), president and CEO, The Second Cup, Ltd.
For further information and to register for this event, please visit laurieralumni.ca/cir.